St Helens powered to victory in the Challenge Cup final after wearing down battling Catalans Dragons at Wembley. Tries from James Roby and Ade Gardner, either side of a Younes Khattabi reply, gave Saints a 12-4 half-time lead. Paul Wellens capitalised on a fumble to stretch Saints' lead just after the break before Paul Clough also crossed. Dragons were given hope by Justin Murphy's score but Gardner added a late try for Saints, with Sean Long booting five goals to seal the win. A cagey opening was punctuated by some brutal defending, and the closest either side came to scoring in the stifling heat came after 20 minutes. Saints centre Matthew Gidley was denied a certain-looking try when he was blocked by a superb pincer-tackle by Stacey Jones and Clint Greenshields. Catalans second row Jason Crocker then thought he had scored three minutes later when he chased a kick-through and grounded, although his left hand was over the ball and the referee signalled no-try. A superb tackle from Luke Quigley then denied Leon Pryce a try on the line. And Pryce was robbed again when Gregory Mounis rolled the Saints stand-off over in the tackle just as he seemed poised to score. The breakthrough finally came after 33 minutes when Roby shimmied through the Catalans defence and five miss-tackles for a brilliant solo effort, which Long converted. Catalans bravely hit back when a Saints fumble was picked up and whipped out to Khattabi via Adam Mogg's mis-pass, although Jones's conversion attempt missed the target. Controversially, though, St Helens went further ahead when Gardner crossed wide out, although the final pass looked slightly forward from Gidley. Long fired over a sweet conversion from the touch line to build a 12-4 lead at the break. And Wellens picked up his 23rd touchdown of the year just after the restart when Long's kick-through was fumbled by Greenshields and the fullback gathered to run in under the posts, giving Long an easy conversion. The English team then turned the screw as gaps started to appear in the Catalans defence and Clough was handed an overlap wide out on 52 minutes to run in unopposed. Six minutes later, Catalans were given hope when a poor pass was fumbled by Wellens out wide and Murphy was able to pick up and dash to the line for his 36th try in 45 matches. Saints regrouped and Gardner set off on a long sprint to the line, only to be hauled down just inside the Catalans' half. But from the resultant penalty chance, Long punted over to make it 24-8. And Gardner wrapped up the victory when he added his second try of the afternoon as the Dragons' defence wilted in the heat, with Long adding the extra points. Catalans Dragons: Greenshields, Murphy, Wilson, Raguin, Khattabi, Mogg, Jones, Guisset, Quigley, Chan, Croker, Gossard, Mounis. Replacements: Casty, Ferriol, Duport, K. Bentley. 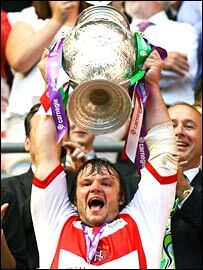 St Helens: Wellens, Gardner, Gidley, Talau, Meli, Pryce, Long, Fozzard, Cunningham, Cayless, Gilmour, Bennett, Wilkin. Replacements: Roby, Graham, Clough, Fa'asavalu.